Some of the most precious things you can leave your family are the memories of meaningful times shared together and an understanding of the values that made you who you are today. These legacies are ones of lasting communication between you and your loved ones. As you plan for the time you may no longer be with your family, it is important to consider another form of communication for which they will be forever grateful. The Ambassador Advisors Family Legacy Journey is a unique process that, when completed, enables you to leave your children a “message of caring” to provide them essential guidance in handling your affairs after you are no longer able. Knowledge is the first step in any good legacy plan. 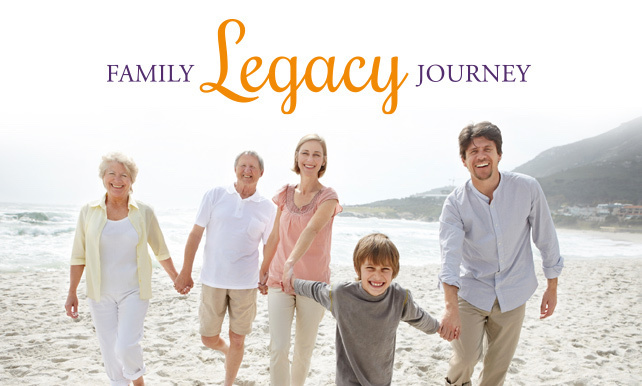 Our informative presentation shares the value of involving your family in the Family Legacy Journey. Contact us for a location nearest you. Once you are ready to move forward, you are invited to use our confidential form to input key information about your legacy plans. The survey results are compiled into a RoadMap that can be used to guide your family members. Ambassador Advisors will create your notebook and provide critical feedback, if needed. Your Notebook is yours to keep and share with your family members. We recommend that you store it in a safe place, along with other important legal documents, such as your Will and Power of Attorney. Once you’ve received your Notebook, further analysis and recommendations may be desired. An additional meeting can assist you in delving deeper into area of your legacy that might concern you or where careful and insightful planning might enhance your Notebook.